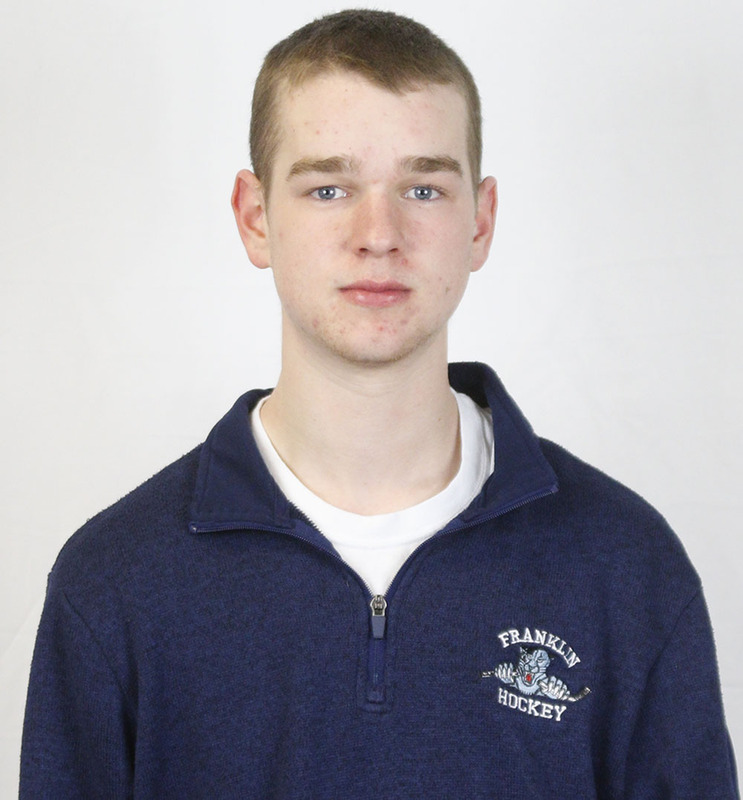 2018 HockomockSports Boys Hockey Awards 2018 HockomockSports Boys Hockey Awards 2018 HockomockSports Boys Hockey Awards 2018 HockomockSports Boys Hockey Awards 2018 HockomockSports Boys Hockey Awards 2018 HockomockSports Boys Hockey Awards 2018 HockomockSports Boys Hockey Awards 2018 HockomockSports Boys Hockey Awards 2018 HockomockSports Boys Hockey Awards 2018 HockomockSports Boys Hockey Awards 2018 HockomockSports Boys Hockey Awards 2018 HockomockSports Boys Hockey Awards 2018 HockomockSports Boys Hockey Awards 2018 HockomockSports Boys Hockey Awards 2018 HockomockSports Boys Hockey Awards 2018 HockomockSports Boys Hockey Awards 2018 HockomockSports Boys Hockey Awards 2018 HockomockSports Boys Hockey Awards 2018 HockomockSports Boys Hockey Awards 2018 HockomockSports Boys Hockey Awards 2018 HockomockSports Boys Hockey Awards 2018 HockomockSports Boys Hockey Awards 2018 HockomockSports Boys Hockey Awards 2018 HockomockSports Boys Hockey Awards 2018 HockomockSports Boys Hockey Awards 2018 HockomockSports Boys Hockey Awards 2018 HockomockSports Boys Hockey Awards 2018 HockomockSports Boys Hockey Awards 2018 HockomockSports Boys Hockey Awards 2018 HockomockSports Boys Hockey Awards 2018 HockomockSports Boys Hockey Awards 2018 HockomockSports Boys Hockey Awards 2018 HockomockSports Boys Hockey Awards 2018 HockomockSports Boys Hockey Awards 2016 Attleboro Canton Foxboro Franklin King Philip Mansfield Milford North Attleboro Oliver Ames Sharon Stoughton Taunton Attleboro Canton Foxboro Franklin King Philip Mansfield Milford North Attleboro Oliver Ames Sharon Stoughton Taunton was one of the premier forwards in the hockomock league and we will miss him. Boys Soccer Awards 2018 HockomockSports Boys Hockey Awards 2018 HockomockSports Boys Hockey Awards HockomockSports Attleboro Canton Foxboro Franklin King Philip Mansfield Milford North Attleboro Oliver Ames Sharon Stoughton Taunton HockomockSports HockomockSports HockomockSports HockomockSports HockomockSports HockomockSports HockomockSports HockomockSports HockomockSports HockomockSports HockomockSports HockomockSports HockomockSports HockomockSports HockomockSports HockomockSports HockomockSports HockomockSports HockomockSports HockomockSports Your source for comprehensive coverage of the Hockomock League. We provide recaps, features, standings, schedules and much more. 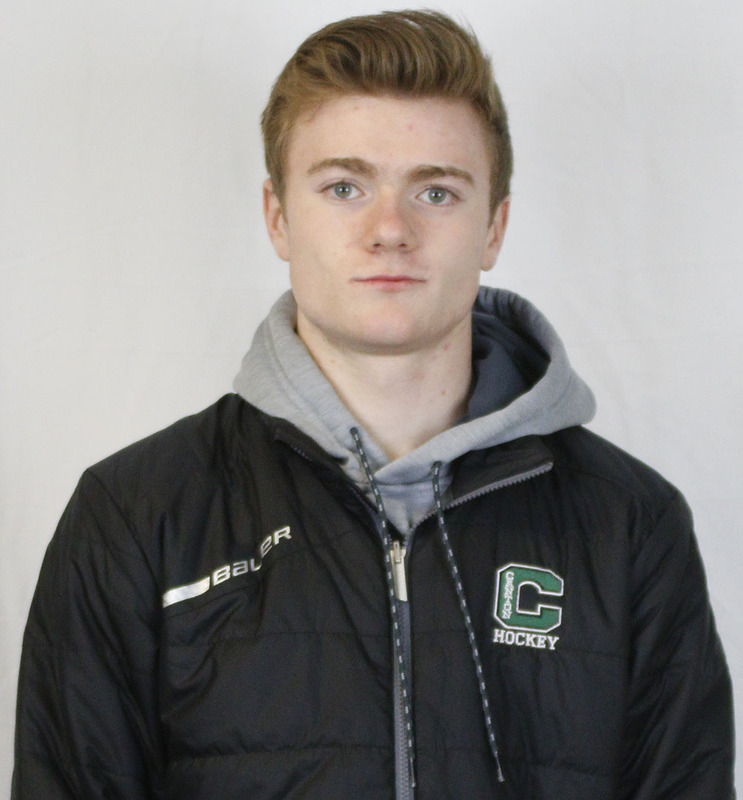 Canton junior Ryan Nolte has been named the 2018 HockomockSports.com Hockey Player of the Year. 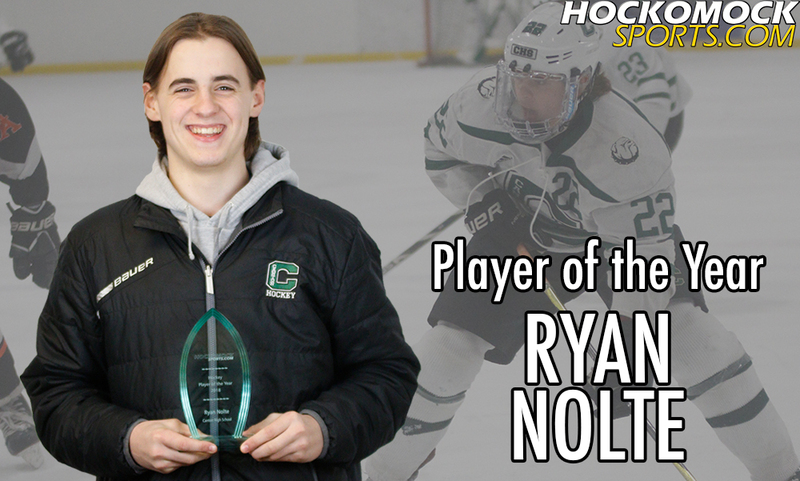 Nolte is the fifth recipient of the award in its six-year history and third straight selection from Canton. 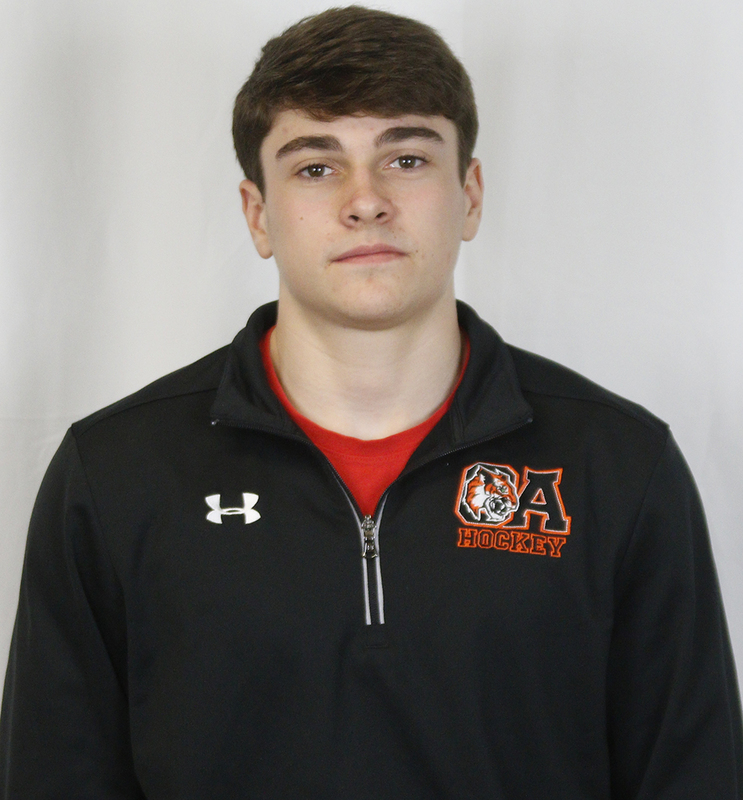 Nolte was also voted as a Hockomock League All Star by the coaches after helping the Bulldogs win their eighth straight Davenport Division title, posting a perfect 10-0 league record. Canton remains the lone team to win a Davenport crown in boys hockey. 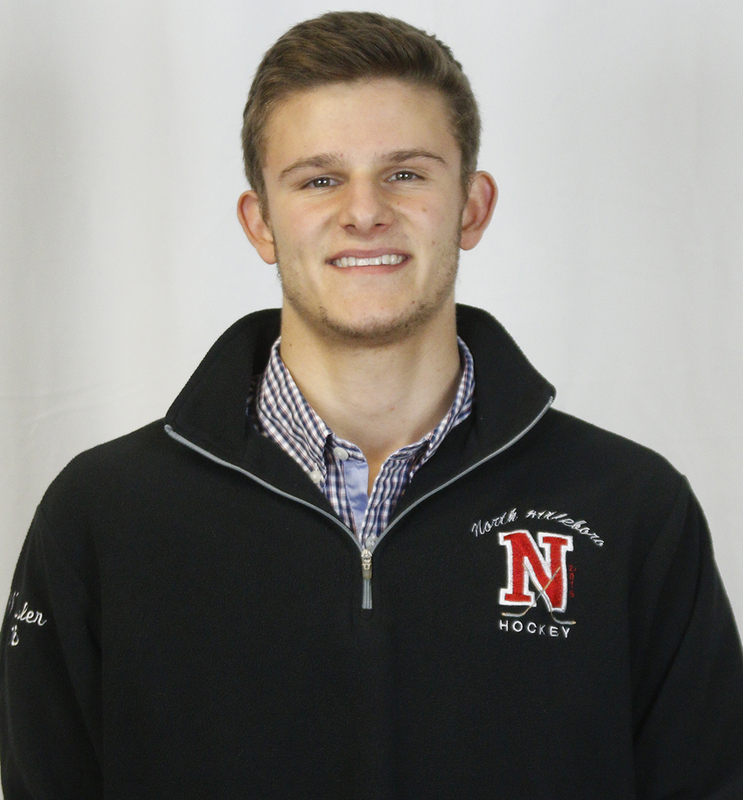 Nolte was tied for the team lead with 36 points this season, including a team-high 18 goals and 18 assists. Nolte follows former teammate Jackson Maffeo as the winner of this award. Maffeo earned Player of the Year honors in each of the previous two seasons. 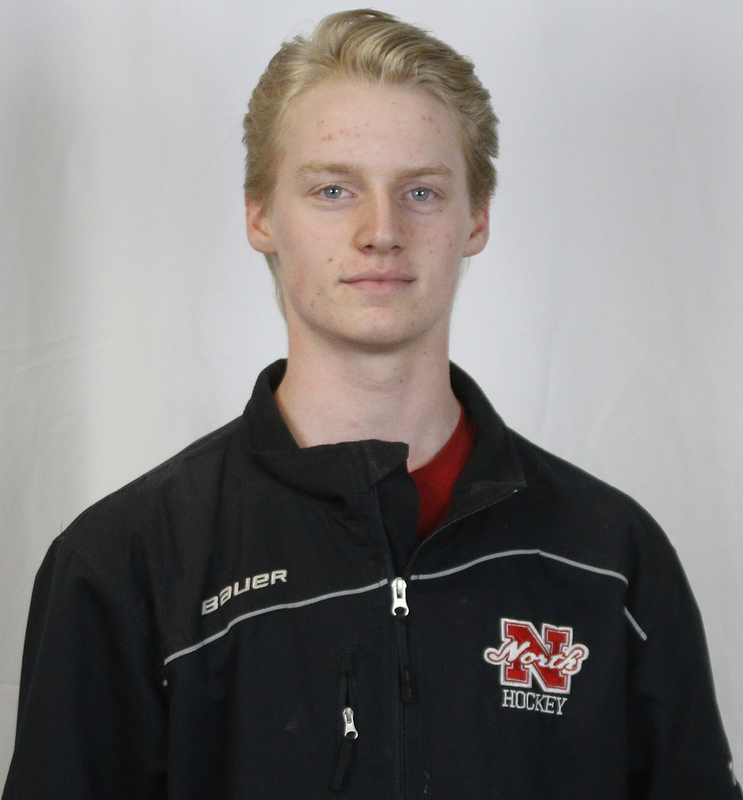 Nolte is the first forward selected since 2015. Nolte joins Maffeo (2016, 2017), Franklin’s Ryan Spillane (2015), Oliver Ames’ Tyler Provost (2014) and Canton’s Brian Brooks (2013) as winners of the award. Please note these are the HockomockSports.com Awards and are selected strictly by our staff. 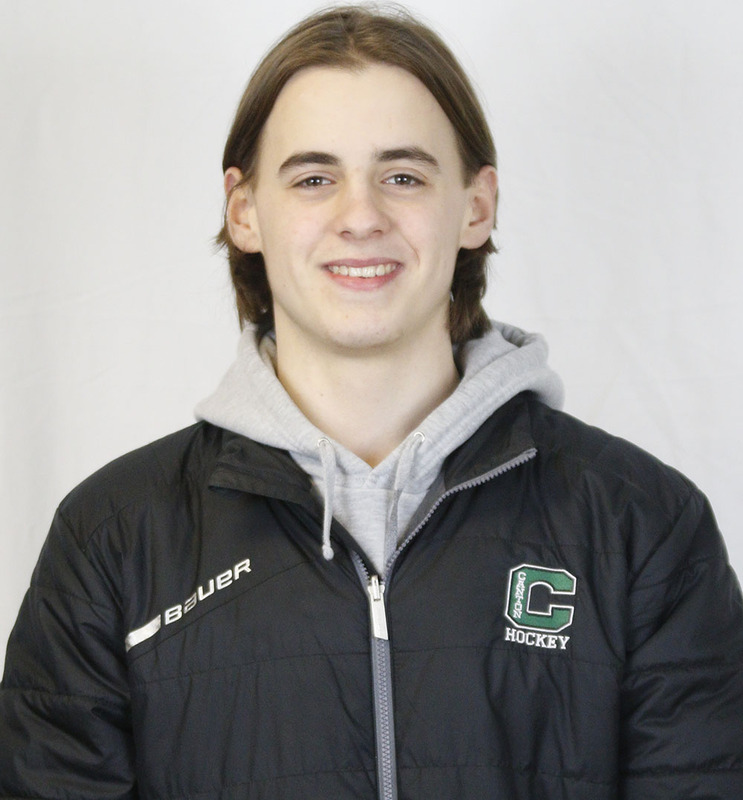 Canton sophomore forward Johnny Hagan has been selected as the 2018 HockomockSports.com Boys Hockey Underclassman of the Year. This is the sixth season that the award has been handed out. 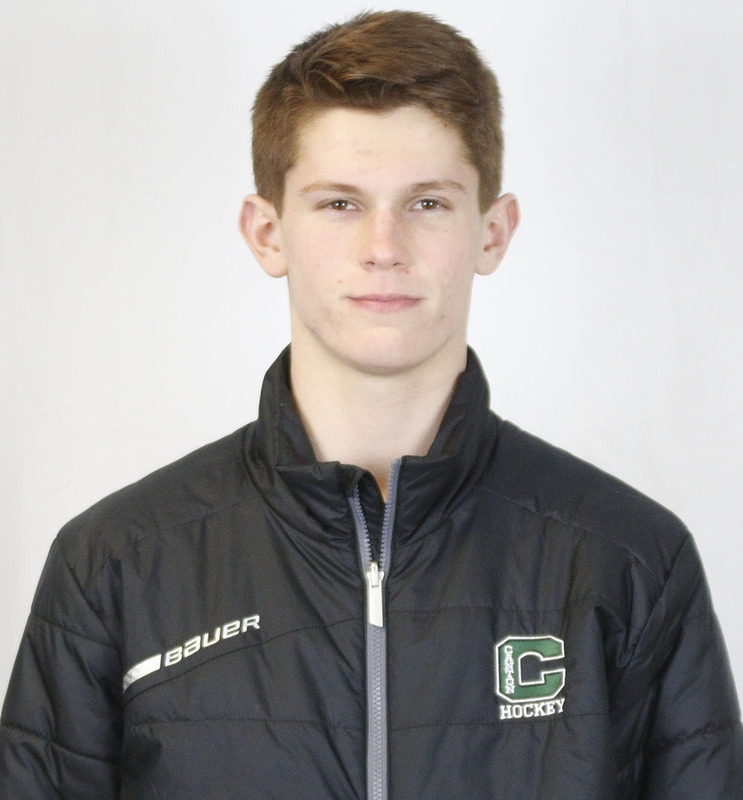 Hagan is the second straight Canton player to be selected following his linemate and 2018 Player of the Year Ryan Nolte. Hagan tied for the team-lead with 27 points during the regular season. He deposited 10 goals while dishing a team-high 17 assists. In the playoffs, the sophomore registered nine points in just three playoff games, scoring four goals and adding five assists. 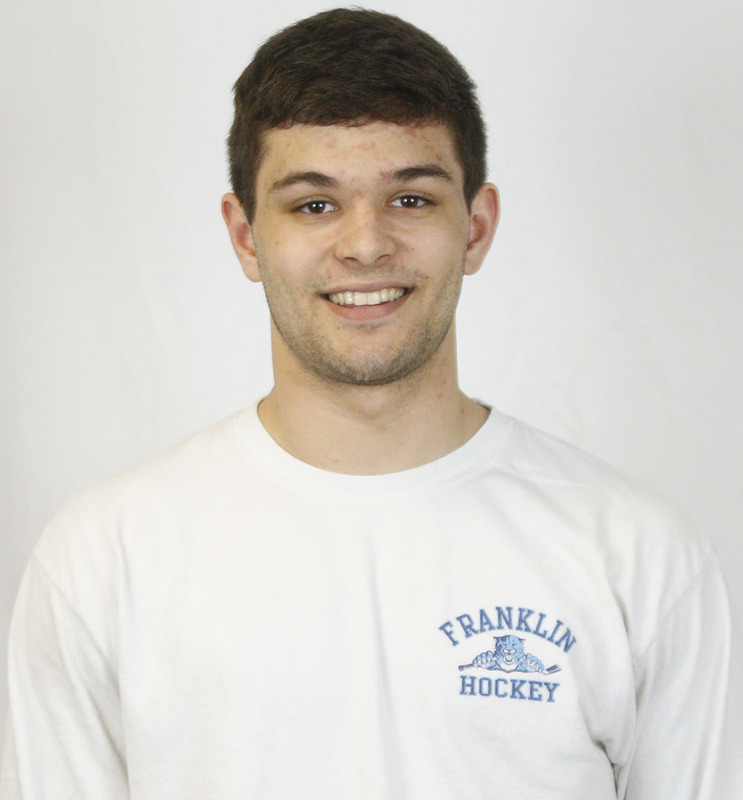 He scored twice in Canton’s comeback attempt against Plymouth South in the sectional finals. Hagan is the fourth player from the Davenport division to win the award, and fourth Canton player to win. He joins Ryan Nolte (2017), Jackson Maffeo (2015) and Matt Lazaro (2014) along with North Attleboro’s Ryan Warren (2016) and Sean Young (2013). 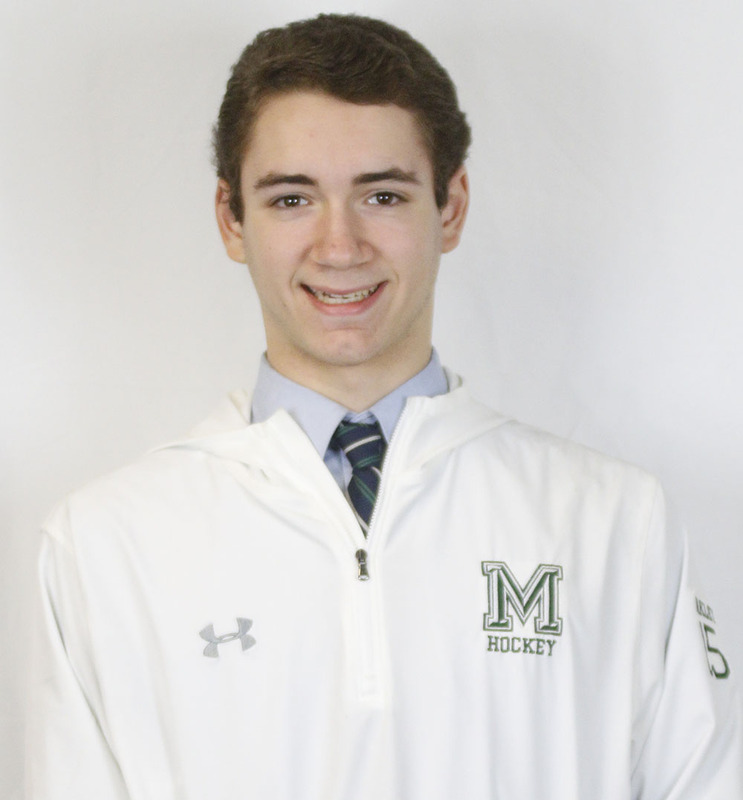 Sean McCafferty, Mansfield – McCafferty emerged as one of the top goaltenders in the league this winter, building on his impressive freshman season to allow only 1.85 goals against and save 92 percent of the shots that he faced. 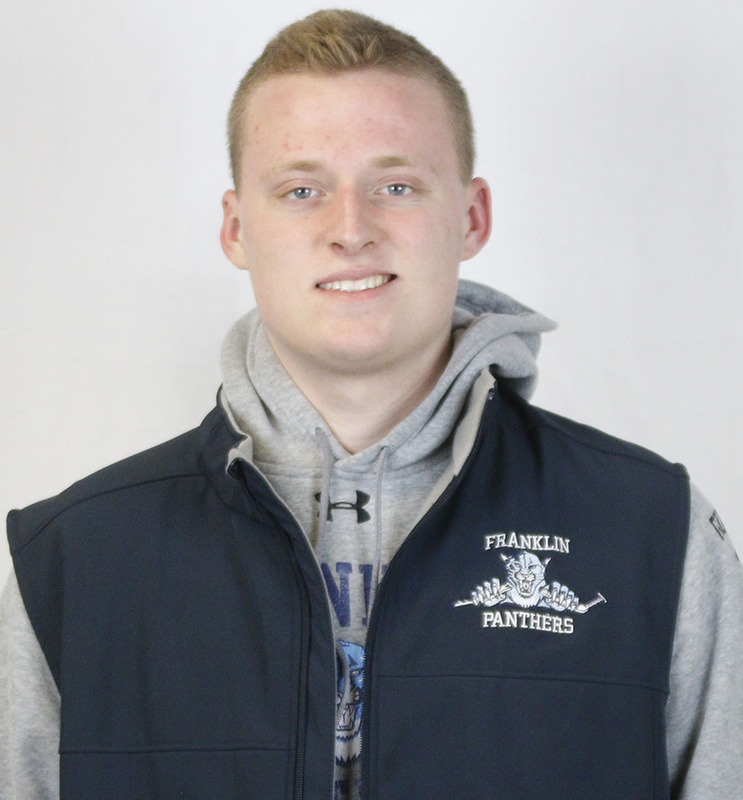 McCafferty made 377 saves this year and helped Mansfield battle Franklin to the end for the top spot in the Kelley-Rex division. 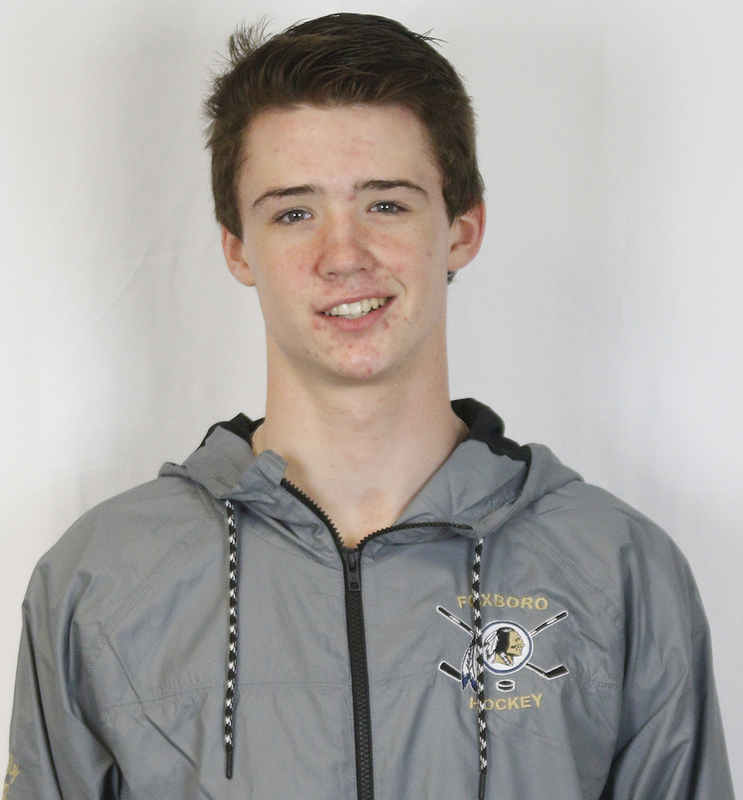 Owen Lehane, Canton – Lehane, a freshman, stepped right into one of the best defensive units in the league and looked like a veteran for a team that allowed only 23 goals in 24 games and ran through a perfect league campaign. 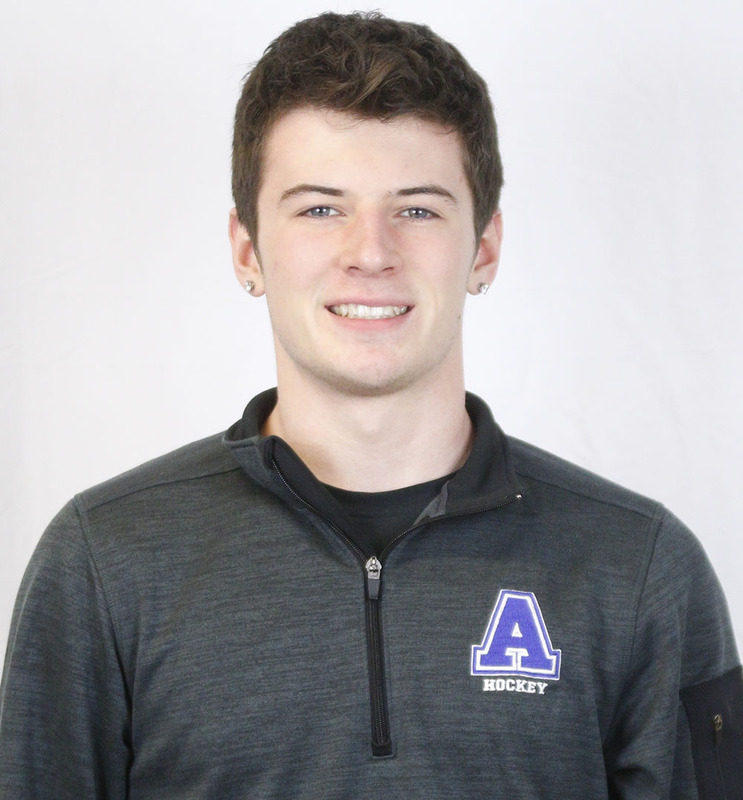 Lehane also stepped into the attack to score three goals and record 10 assists, making him the team’s top scoring defenseman. 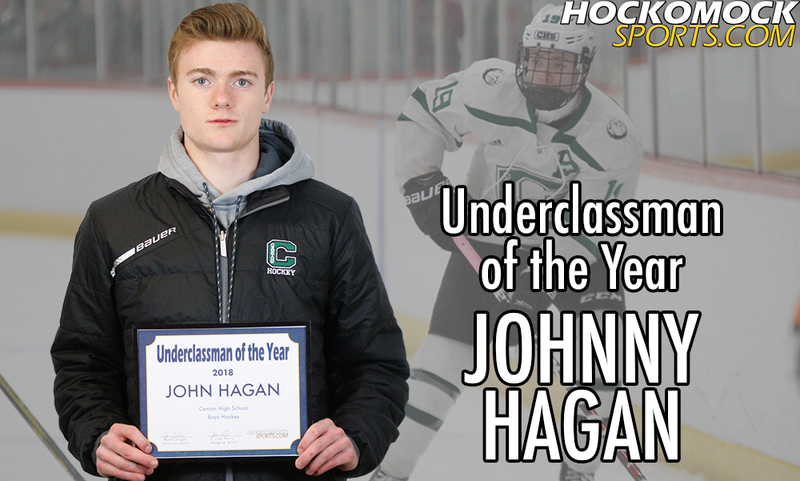 Johnny Hagan, Canton – The 2018 Underclassman of the Year built on his impressive rookie campaign by tying for the team lead in points with 36. 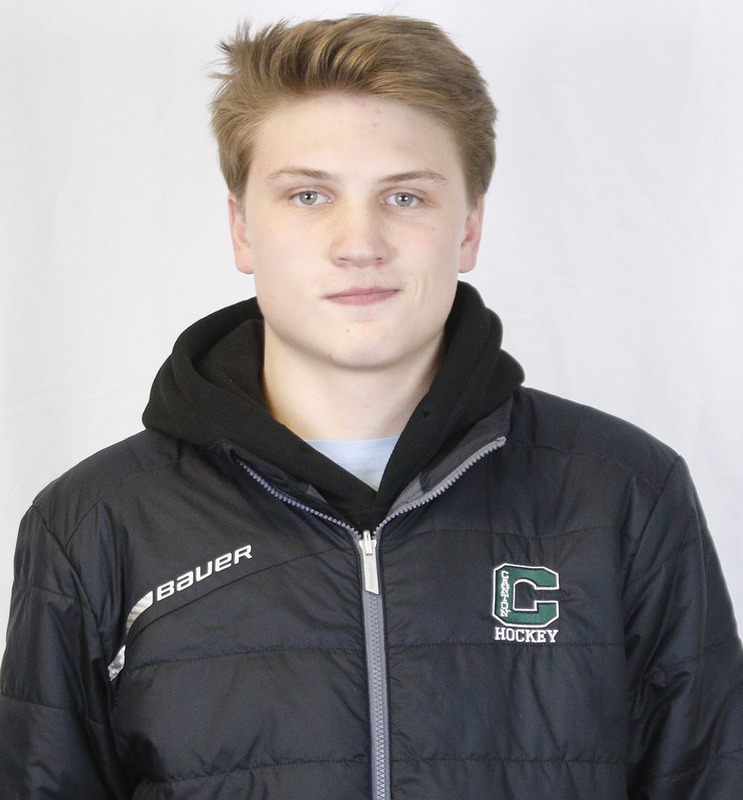 Hagan scored 14 goals, which was second on the team, and added a team-high 22 assists, making the Canton top line one of the most potent in the Hockomock and his physical play added an edge that helped Canton win an eighth straight Davenport title. 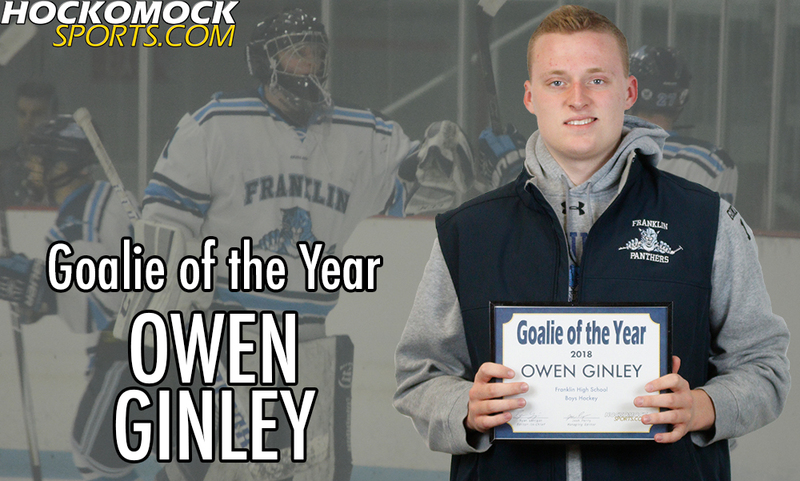 Franklin senior Owen Ginley has been selected as the 2018 HockomockSports.com Goalie of the Year. 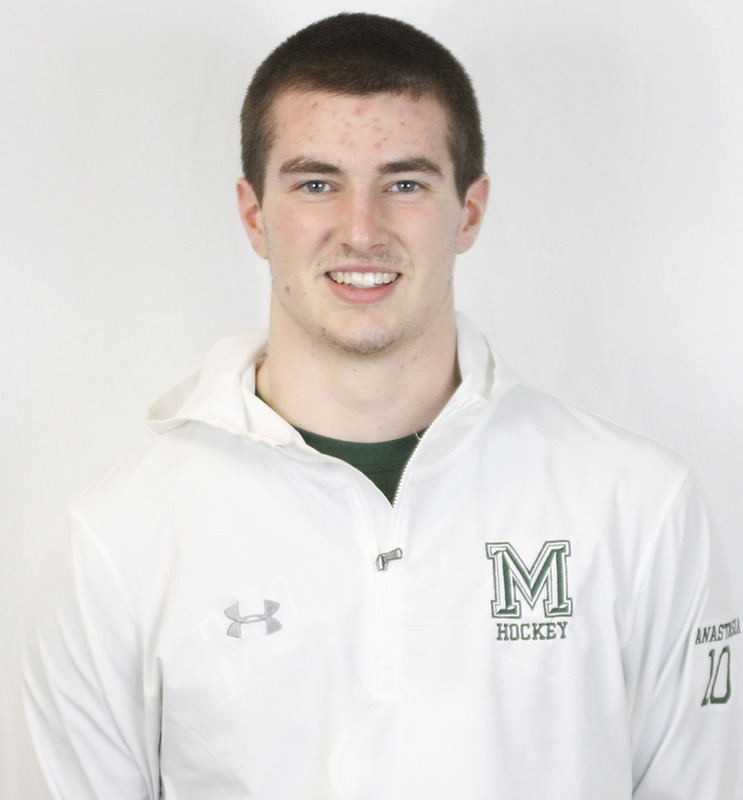 Ginley is the fifth goalie to receive the honor in its sixth season being awarded. 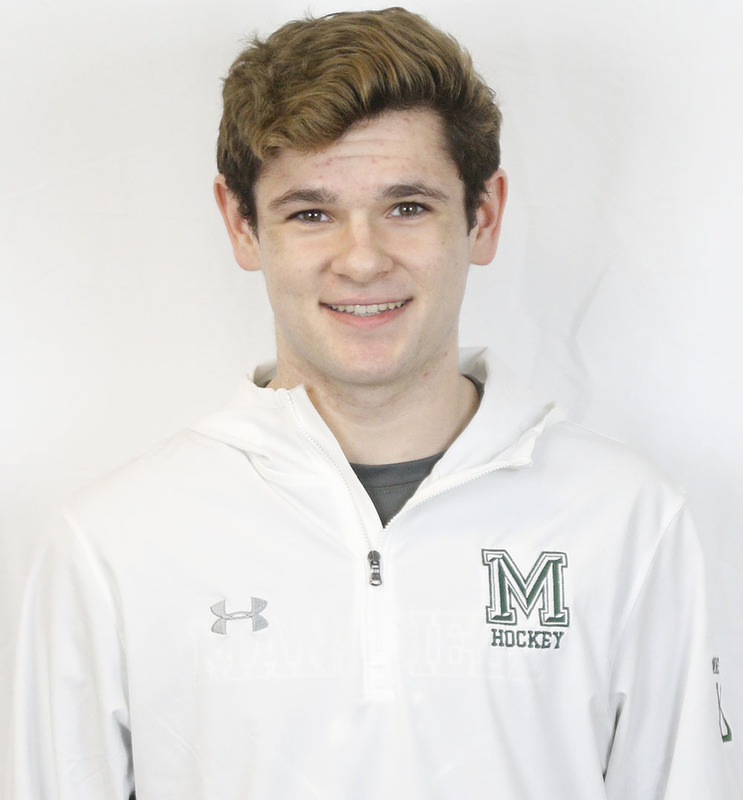 During the 2017-2018 season, Ginley made 469 saves with just 39 goals allowed for a 0.917 save percentage. He had a 2.40 goals against average this season and recorded one shutout. 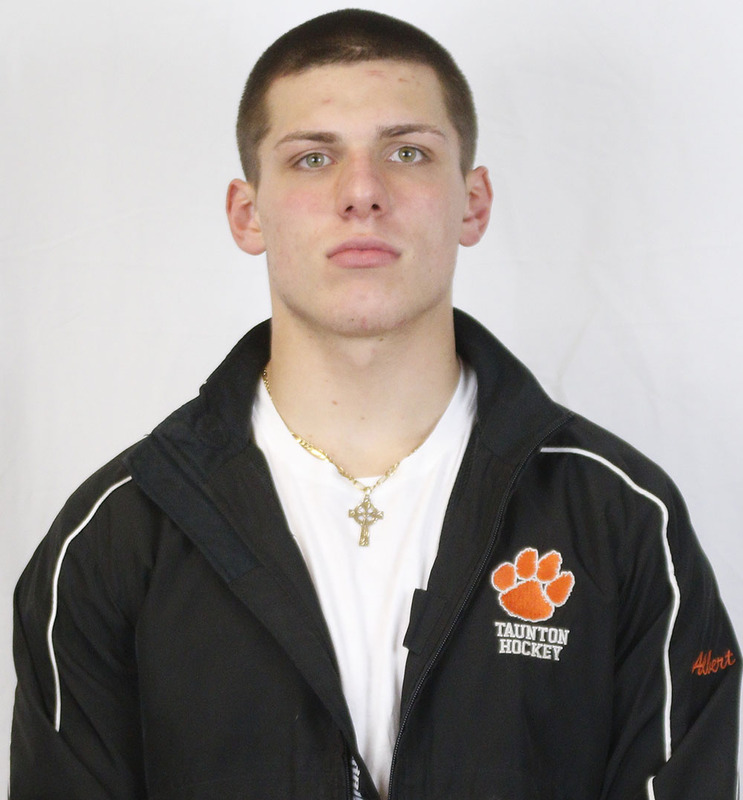 He was also named to the HockomockSports.com First Team and was also voted a Hockomock League All Star by the coaches. 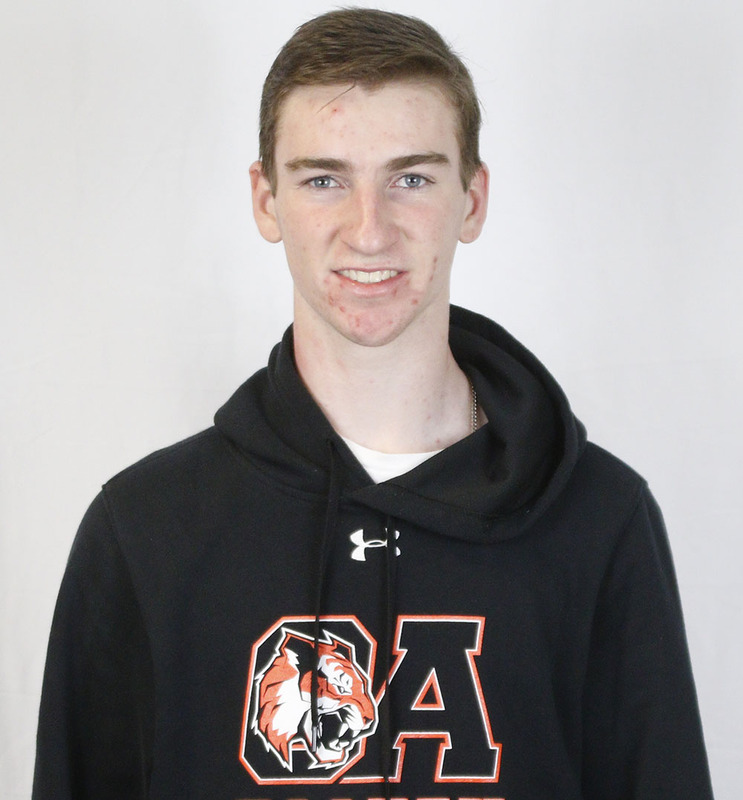 “Owen had a great senior year in goal, he kept his team in many games at the start of the season which propelled us to a 12-1-3 record in the first 16 games,” said Franklin head coach Chris Spillane. 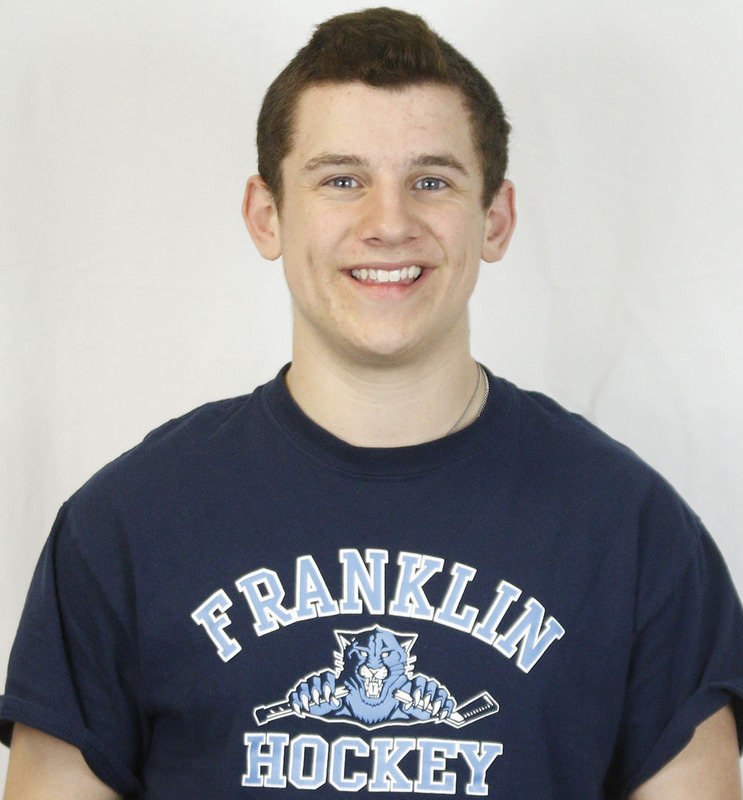 Spillane is the second goal from Franklin to win this award, joining Ryan Shea (2015). Other winners include Canton’s Quinn Gibbs (2017) and Justin Slocum (2016) and Oliver Ames’ Jimmy Tierney (2013, 2014). 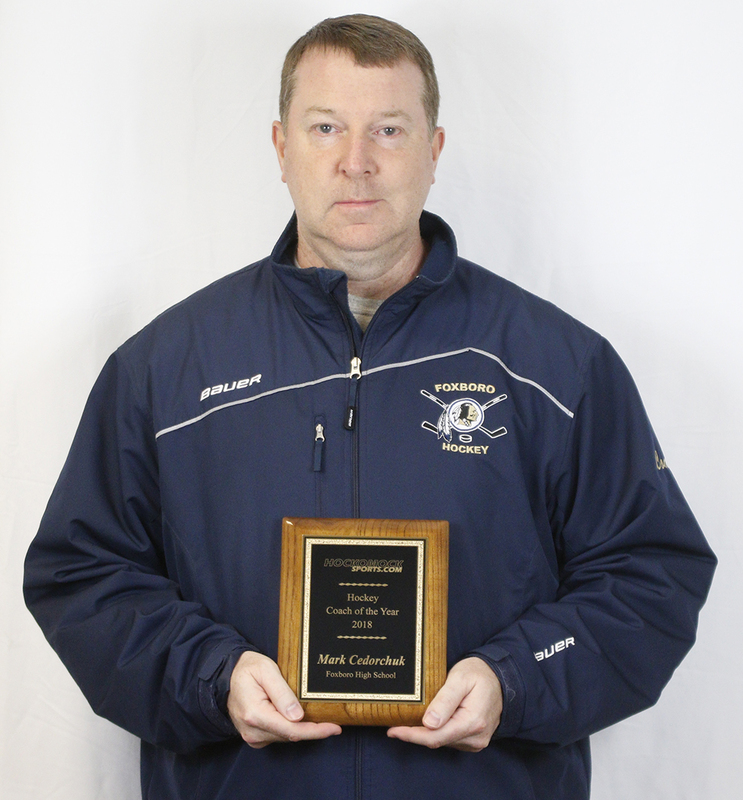 Foxboro head coach Mark Cedorchuk has been selected as the 2018 HockomockSports.com Boys Hockey Coach of the Year. In his second year at the helm, Cedorchuk led the Warriors to the best record in program history. Although Foxboro had qualified for the postseason in prior seasons, 2018 was the first time the Warriors reached the postseason by having a .500 record or better. During the regular season, the Warriors finished 10-8-2 overall, and 3-4-2 in Hockomock League play. Foxboro was third in the Davenport division, just two points shy of North Attleboro in second place. In the postseason, Foxboro earned the #13 seed in the MIAA Division 3 South tournament. The Warriors fell in the opening round to #20 Ashland. Cerdorchuk joins Oliver Ames’ Sean Bertoni (2017), Franklin’s Chris Spillane (2016, 2015) and Canton’s Brian Shuman (2013, 2014) as winners of the award.